Jason Hartman talks with former FBI agent Joe Navarro about the possibilities of us reaching doomsday, damage done by espionage breaches, body language tips and tricks, and what’s changed in the last 30 years. 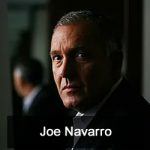 Joe Navarro is a former FBI agent who spent 25 years working in counterintelligence and counterterrorism. His specialty was non-verbal communications. After leaving the agency, Joe has become a speaker, consultant, and author, writing books such as What Every Body is Saying, Louder Than Words, and his newest book, Three Minutes to Doomsday.